How’d you do with your bets across the first three days of the NCAA Tournament? Whether you banked on UC Irvine upsetting Kansas State or got burned by Duke ’re in the hole, currently ahead or came out even - it’s time to dive into Saturday’s second-round action with eight games to choose from! Iowa busted some brackets with its first-round win over Cincinnati, and the Hawkeyes should keep their Round-of-32 matchup much closer than the line suggests. Tennessee struggled to put away 15-seed Colgate on Friday and ended up winning by just seven points when it was all said and done. 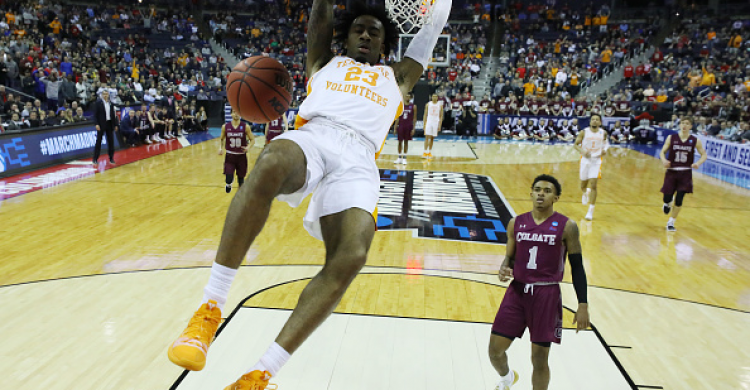 Iowa is a much tougher matchup for the Vols and the underdog can take advantage from the three-point line just as Colgate did. The Raiders drained 15-of-29 from three-point range (51.7%) as Tennessee’s allows 35% of opposing points via the three-pointer, the 58th-highest mark in all of college basketball this season. Meanwhile, Iowa has the 14th-most efficient offense (per KenPom) and went 18-for-31 from deep (58%) in the win over Cincy. The Hawkeyes play fast and can score with the best of them and should keep this game close, no matter which team comes out on top. We get a rare 12-13 matchup this weekend as UC Irvine and Oregon both pulled off first-round upsets on Friday. The Anteaters squeaked out their win against an injury-plagued Kansas State team that limped into the tournament. On the other side, though, Oregon looked really impressive with it’s 18-point pummeling of 5-seed Wisconsin - and the Ducks have now won nine straight games dating back a month, including a Pac-2 tournament run to earn them a bid into the Big Dance. Irvine has won 17 straight themselves - but the magic could run out on Sunday considering how good Oregon looked in their first-round win. Payton Pritchard is playing lights-out for the Ducks and the supporting cast of Louis King, Paul White and Kenny Wooten has hit a rhythm on both ends that’s anchored back-to-back wins over Pac-12 regular season champ Washington and the favorite Badgers.